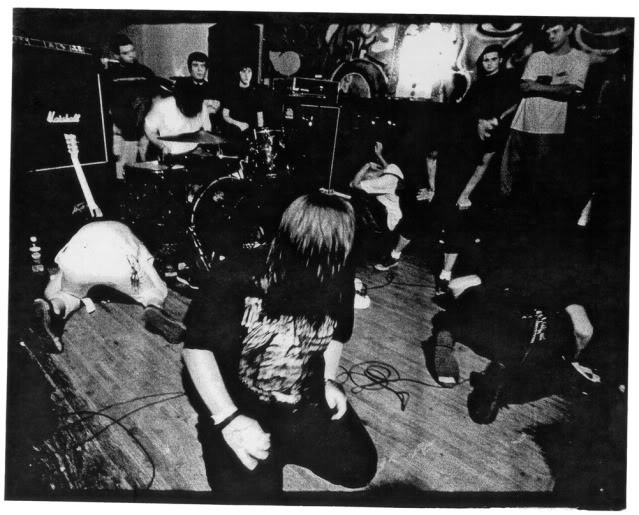 The immensely influential Virginia band PG.99 have announced a second reunion show, now set to perform on Saturday August 27th at The Black Cat in Washington, DC.They will be performing alongside longtime friends and New Orleans doom masters THOU. PG.99’s first reunion show will be in Richmond, VA at Best Friends Day, August 19th with Converge, Capsule and The Catalyst. To coincide with the reunion shows, the band’s collection-album, “Singles”, will be issued on vinyl for the first time via Robotic Empire (originally released on CD by Reptilian Records in 2003). This 18-track collection was newly mastered by James Plotkin and three preview tracks are streaming on bandcamp orsoundcloud. The vinyl is available in three different colors and the preorder can be found here. For the “Singles” Collection cover + tracklisting…. This entry was posted on Tuesday, July 12th, 2011 at 5:21 pm	and tagged with Best Friends Day, capsule, converge, diy, doom, nola, page 99, PAGENINETYNINE, pg.99, reunion shows, richmond, robotic empire, rva, screamo, skramz, sludge, The Catalyst, thou, virginia and posted in Music News, News. You can follow any responses to this entry through the RSS 2.0 feed.